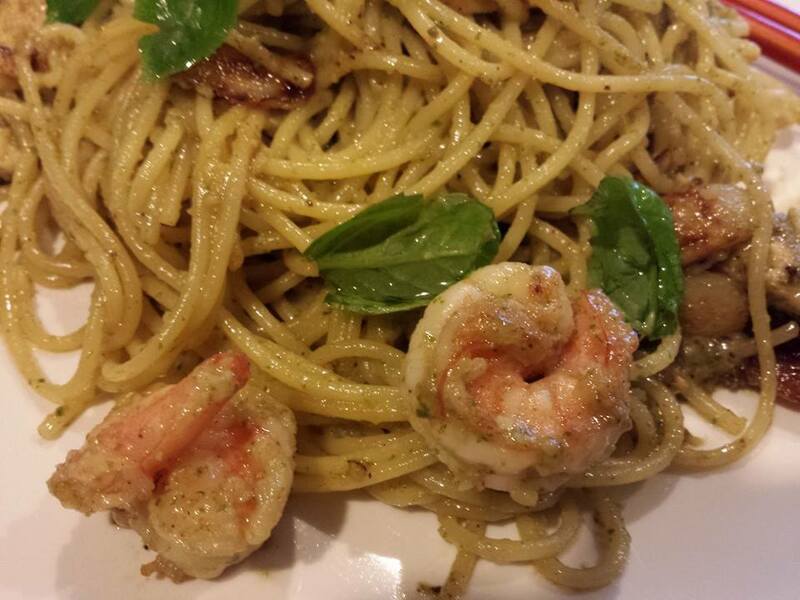 i had mostly associated pesto pasta with vegetarian, and since i only started cooking 2 years ago & i mostly prefer meats, so i had started with seafood alio olio, later experimented on pink sauce (creamy tomatoes), chilli crab pasta etc. i have not yet attempted a carbonara myself (though my son makes a pretty good one & it should not be hard to do also). i tried the recipe first on a small pasta dish, as i was reminded that pine nuts were very expensive…haha. 🙂 the first attempt was top photo above, which i grilled the eggplant & cherry tomatoes first, then tossed with the spaghetti & the pesto sauce. 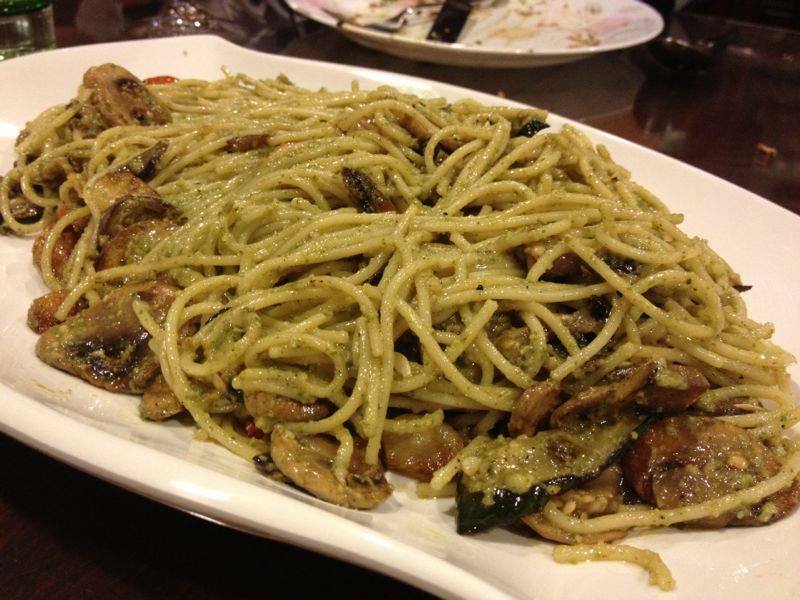 it was very flavourful, the nutty fragrance with the spinach & basil, and very tasty eggplants & tomatoes. it was though a little salty. on the next occasion i prepared a larger portion as 1 of 3 pastas for a 6pax homecooked family dinner. this time i included zucchini & also caramelised some button mushrooms. for the pesto sauce, i added basil, spinach, 1 clove of garlic & 1/2cup olive oil, some salt & pepper. i used chopped toasted almonds as proxy to the pinenuts & i added some shredded parmesan. it was a really excellent pasta. add spinach, basil, almonds to blender & blend. then add olive oil & grated parmesan & blend. 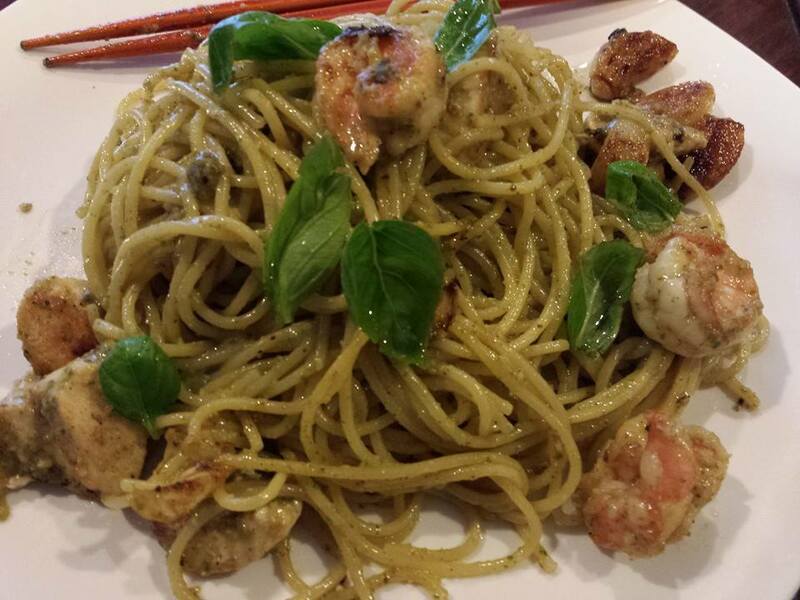 add spaghetti to pesto sauce in a pan & toss. add salt & pepper to taste. serve. This entry was posted in Recipes and tagged button mushrooms, cherry tomatoes, eggplant, fresco, laksa pesto, milan, pesto, wild rockets, zucchini. Bookmark the permalink.